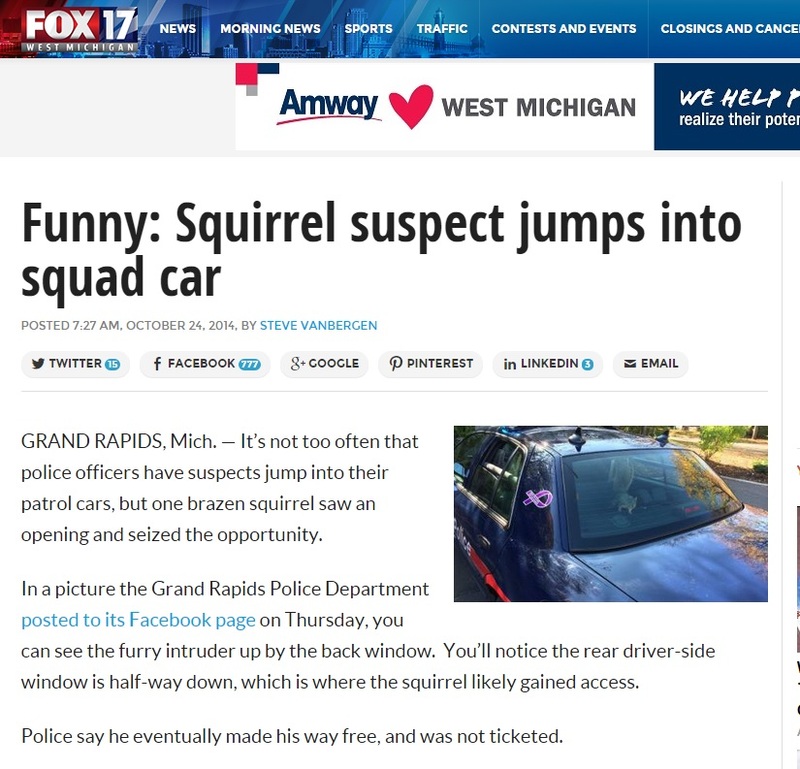 Did they read this squirrel his Miranda Rights? 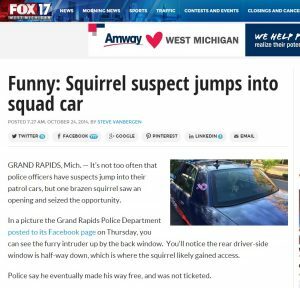 A squirrel was found in a police car – looking for donuts? Locals were concerned and called the cops when a squirrel was chasing children away from a playground, but it appears that the squirrel was just stashing nuts under a swingset. Unfortunately, the animal control officer used this as an opportunity to misinform children about squirrel hibernation habits (tree squirrels don’t hibernate) but OH WELL. A massive squirrel-related power outage was reported in Providence, RI (where the squirrel touched the substation “in the right way” – some of us might say “in the wrong way”), some residents were pleased by getting the afternoon off from work, but the resulting fire and chaos led to a delay in a bribery trial. No worries, the local mall was still powered. Squirrels shut off power in Seymour, IN, Pueblo, CO, Northhampton, MA, Muskegon, MI (where children were dismissed from school), Lewiston, ME, Brattleboro, VT, and Emporia, KS. A man who was bowhunting is in serious condition after another hunter mistook him for a squirrel and shot him in the head. I’m still not clear on how this happens – do you just see what you want to? And this teen shot himself in the leg while prepping for a squirrel hunt. A “treetop adventure centre” had to shut down operations after they discovered that squirrels had chewed through ropes and part of a power fan. I guess when you are in “simulated free-fall” you don’t want to leave your fate up to squirrels – so the adventure center has built a cage around the equipment to keep the squirrels out. Thaddeus McRae has studied how squirrels respond differently to aerial and ground predators, including the squirrel's various alarm calls, with unique methods that included a robotic cat. Speaking of ground and aerial predators - a cat stalks a squirrel – but then the squirrel decides to chase the cat! Yes there is video. But it’s not always that easy for the squirrel – watch this rodent run for their life from a hawk. A country club or red squirrels – which would you rather have? Conservationists are trying to ensure that a massive hotel and spa won’t have a negative impact on the endangered red squirrel. And scientists are using computer modeling to understand how the squirrelpox virus may spread from the gray squirrel population to red squirrels. Flying squirrels on the increase? In Finland, wildlife authorities are getting several calls from locals reporting flying squirrels – mainly concerned that sightings of this beautiful but at-risk animals may impact their ability to develop areas where they are seen. GO HUMANS! Sort of. Scientists are analyzing 100 year-old squirrel skins for science, helping get genetic information that can be applied to increase understanding of endangered squirrel species and their conservation. White squirrels in Park Slope in Brooklyn and Worcestershire in the UK caused excitement recently. The Park Slope squirrel caused the Gothamist to ask (perhaps in poor taste) “What other white animals would you like to see in Brooklyn?” Uh, last I checked Brooklyn was already pretty gentrified. Learn how this squirrel lost his tail and lived to tell. The golden-mantled ground squirrel is cute, chatty, and often mistaken for a chipmunk. Read more about this creature here. A yearly squirrel count revealed fewer gray and white squirrels with an increase in fox squirrels. A town that actually encourages squirrel feeding! If you’d like to know the temperature during the squirrel count, the Olney Daily Mail will let you know that too (it's a three-page article about the squirrel count). What do squirrels do during the solar eclipse? Turns out, they are extra restless. Learn how animals respond to the unique changes that happen during an eclipse. 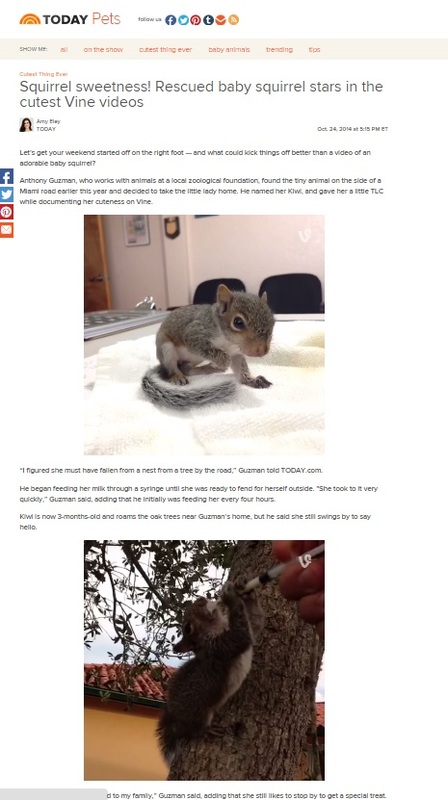 In case you never get tired of watching fostered baby squirrels being hand fed…this is for you.